Every year it’s the same. Garland and lights drape the kitchen cabinets; colorful decorations adorn the living room and every door of the house. When those Christmas decorations come down in January the house seems as bare as the winter trees outside the windows. This week, once we recovered from taking down the Christmas decor, we created somesuper cute paper heart penguins to hang on the doors. 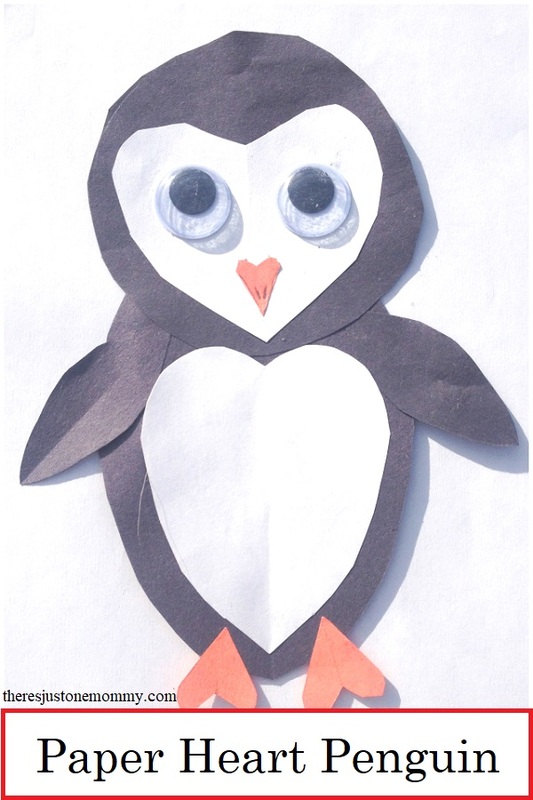 These penguins are adorable for winter or make them as a Valentine’s Day craft. 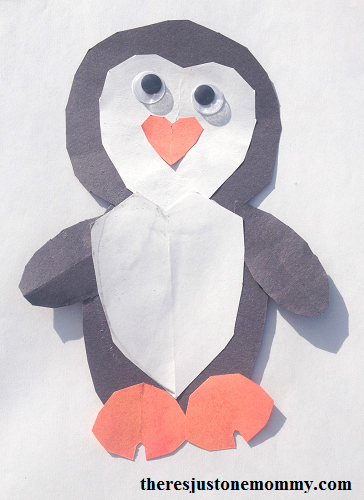 This cute little penguin craft is one of my favorite heart crafts. There is just something about penguins that makes everyone smile. To make the heart penguin’s head you will need a black construction paper circle. For very young crafters you can have the shapes pre-cut. For older children you can trace the shape and have them cut it out, or let them do the tracing, too! We traced a roll of masking tape to create the circle for our penguin heads. Next cut out a white heart shape, slightly smaller than your circle. Glue this to the black circle to create your penguin’s face. A small orange heart makes a great beak. Googly eyes complete your penguin’s head. To make your heart penguin’s body cut out a large oval from black construction paper. Cut out two smaller ovals from black paper. Glue these to the sides of the large oval to become the penguin’s flippers. Next, cut a large white heart that is smaller than the black oval. Glue this heart on to the oval for the penguin’s tummy. Finally, cut out two small orange hearts and attach them as the penguin’s feet. Once the paper heart penguin is dry, be sure to hang him up for everyone to see. Your child may even want to make a little penguin family. Originally published January 8, 2016.